In a large skillet, combine beans, salsa, taco sauce, cumin, chili powder and garlic powder; heat to a simmer, stirring occasionally. 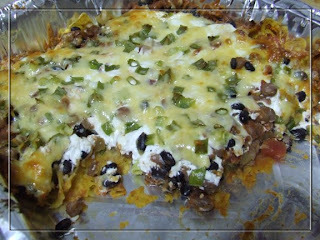 Place tortilla chips in an un-greased 2-quart casserole; top with bean mixture. Spread sour cream over the top, then sprinkle with onions, tomato and cheese; bake, uncovered, for 20 to 30 minutes, or until hot and bubbly. Garnish with shredded lettuce and additional taco sauce, if desired.